Kleine’s remarkable debut is based on two real-life events that occurred in 1981: the attempted assassination of President Reagan, and the murder of a ten-year-old girl (who was a friend of the author.) 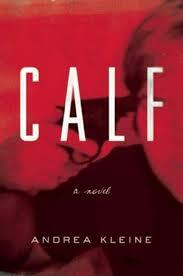 Calf is unsettling in its subject matter, but such a breathtaking book, and imagined brilliantly. It is the dual story of a young girl trying to navigate the complexities of social status and peer pressure in a new school while dealing with turmoil at home, and the increasingly disturbing behavior of an unstable loner, desperate for love, who becomes fixated on “rescuing” a young actress. This one will stick with you.